Great prices on towelling bathrobes ideal for men and ladies. The range of towelling bath robes which we are offering are made from soft 100% cotton carded yarn which means the end product is of exceptional quality. Using the latest dying technologies to make our bath robes means the robe which you buy from this site is not just in good price but also value for money. Best of all buying direct from the wholesaler means you benefit from the prices. If you buying single bathrobe then price is £9.50+VAT. If you buy a pack (£9.00+VAT) then price will be less since with a wholesaler company the more you buy the more you save on cost. These range of bath robes which are on offer are being offered from stock direct from the wholesaler which means you benefit in all respects. Our in-house embroidery means if you are planning a gift for a friend of colleague then have the bath robe personalised. If you intend to buy bathrobes for resort or spa pool and want to buy in bulk then contact us for the best prices. Our fast and quick service means you get the products you want next day. Unlike other companies we are open from Mon to Sat which means if you plan to place an order on Sat then call us and talk to our sales team. 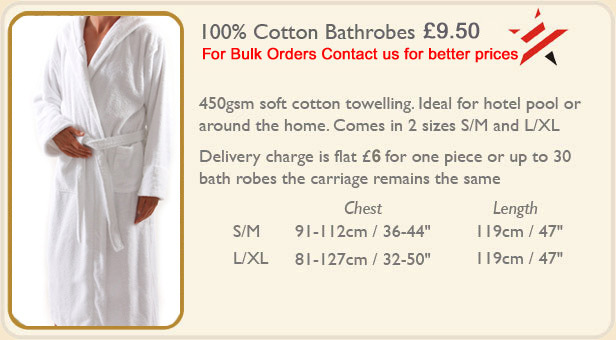 For more information give us a call today and place the order for the towelling bathrobes.